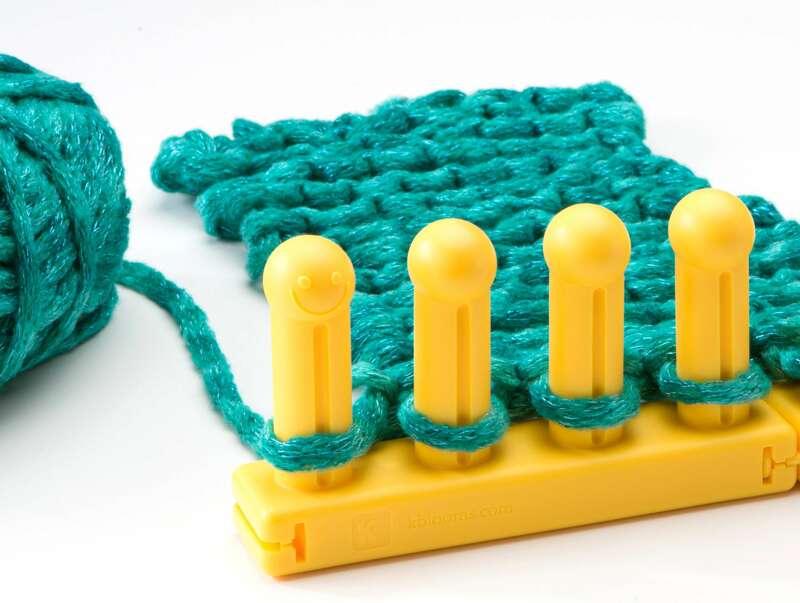 Love the Jacob’s Ladder technique in crochet but don’t know how to crochet? 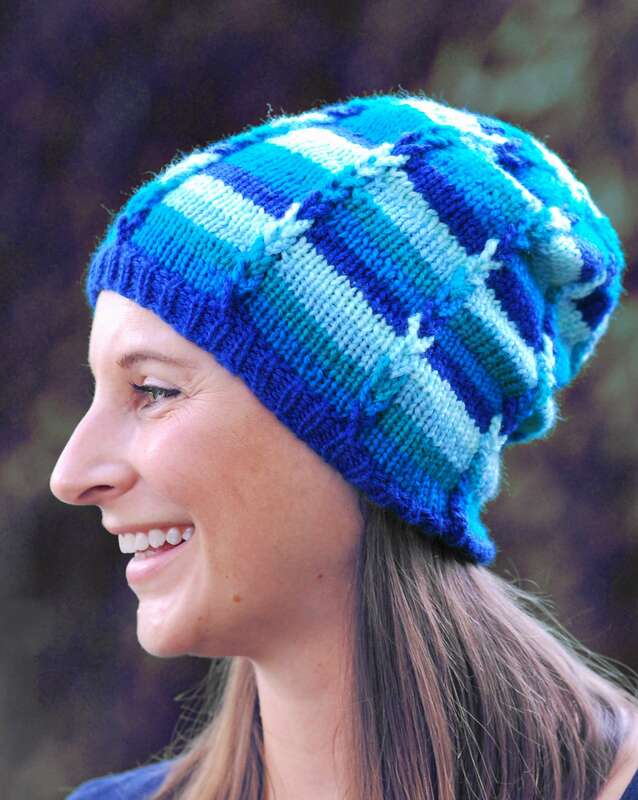 Try the new method of chaining loops developed by Renita Harvey that achieves the same design feature on a stockinette background by knitting this hat! 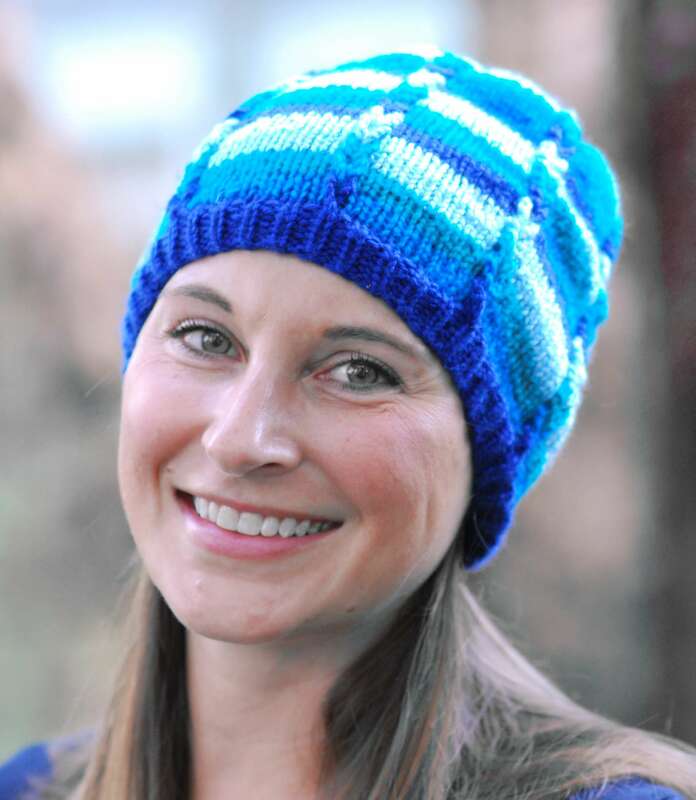 Amaze your friends and family with this fun hat that incorporates both the braided chain loops and color changes. Changing the color after each round of chain loops gives the “ladder” a more visible appearance. 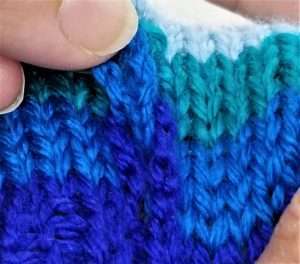 Or use a self-striping yarn with long color changes to avoid changing colors manually. 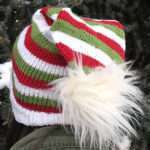 This hat is also a great pattern for school and team colors as well as seasonal color combinations. 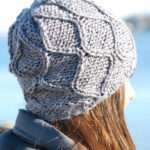 The Polemonium Hat is easier than it appears making it a great pattern for those wanting to up their loom knitting game. 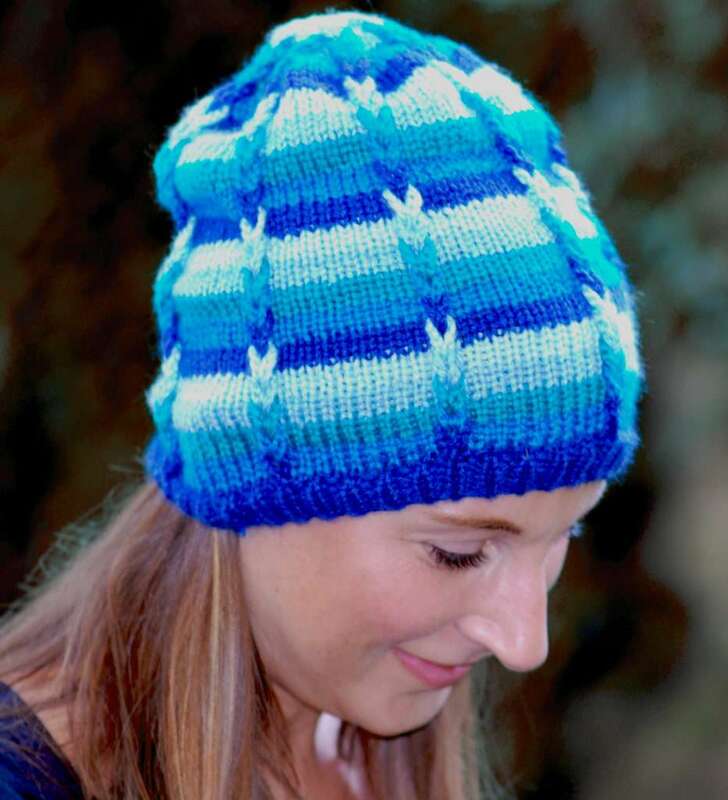 Knit on the All-n-One Loom, the Polemonium Hat has a decreased crown bringing all the “ladders” or braids together at the top achieving a nice clean finish. LOOM: 80 pegs used, small gauge loom. 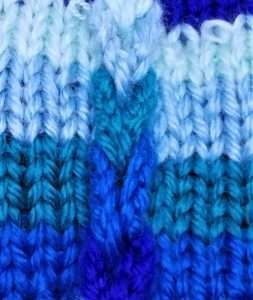 Sample was knit using the All-n-One Loom. Chain: knit same stitch the number of times listed. 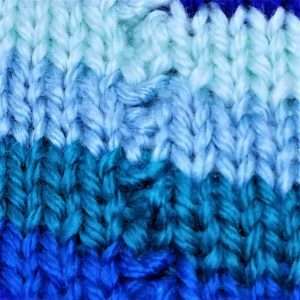 Example: Ch10 – knit the same stitch 10 times using the e-wrap knit stitch. Chain loops will be made on the inside of the hat. Loops will be pushed though the eyelets made after the hat is off the loom. Place stitch markers on pegs 1, 11, 21, 31, 41, 51, 61, and 71. These are the pegs that the chain stitch will be worked. 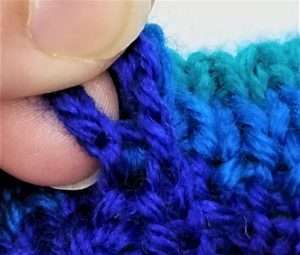 Move the stitch marker with the stitch when working the decreases. With CA, CO 80 pegs and prepare to work in the round. Note: Adjust loom with each decrease round so there are no empty pegs. 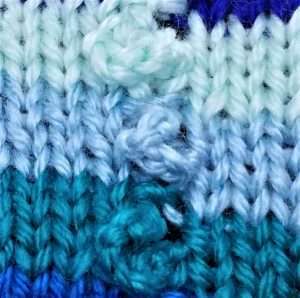 Place all the stitches on a piece of scrap yarn in a contrasting color approximately 20” long before working the decrease round. Adjust the loom to the new peg count listed at the end of the decrease round. 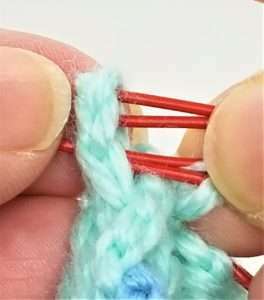 Place the stitches back on the loom following the instructions for that row by placing 2 stitches on the peg for the K2tog and 1 stitch on each of the rest of the pegs. 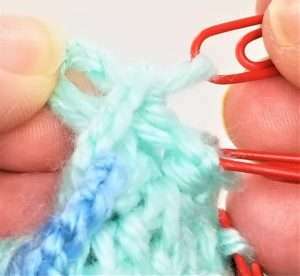 Make sure the stitch markers for the chain loops are moved to the new pegs as well. Work the row as instructed. 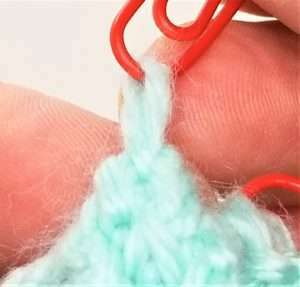 Place each remaining stitch on a paper clip and remove from loom. Cut working yarn leaving a tail 6” long for weaving in. Loops are on the inside of the hat. Push chain loops through the eyelets created by the chains so the loops are on the outside of the hat. then pull the loop above it through the bottom loop. until the top of the hat is reached and the last smaller loop is pulled through. leaving the paper clip on the stitch. Thread yarn tail on tapestry needle and through each stitch. Remove paper clips and gather. This is a fantastic design, Renita! Love it! ? Can this pattern be made on the Rotating Board using 1 ring or even better both rings. This is a very pretty and educational pattern. I tempted to go outside my basic stitches comfort zone. 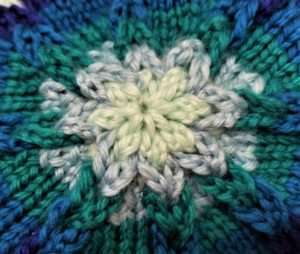 I’m going to start small, making a baby hat. Thank you for making this patter. This pattern is designed to be decreased at the top which is why it is written for the All-n-One loom. While it could be adapted to be made on the DKL, it couldn’t be decreased for the crown, and another way to finish off the braids would need to be devised. It really couldn’t be made with both rings on the DKL.